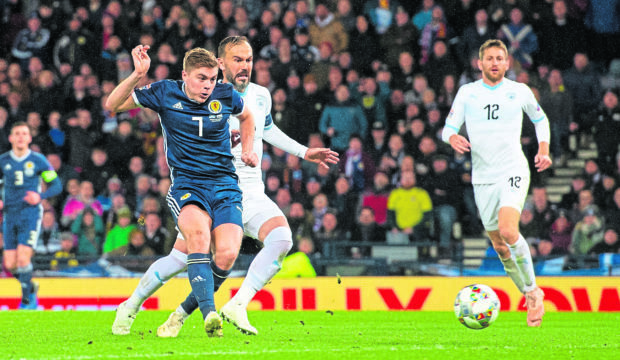 James Forrest’s hat-trick saw Scotland progress to the Euro 2020 play-offs in style, securing the 3-2 victory over Israel required to top their UEFA Nations League section. After romping to victory in Albania without as much as a glove laid on them on Saturday, Scotland had to do this the hard way after Beram Kayal opened the scoring for Israel after just nine minutes. Forrest struck twice before the break however, before adding a third midway through the second half, and although Eran Zahavi pulled one back, Scotland’s night was not to be taken away from them. The outcome is that Scotland are guaranteed to be in the play-offs for a major tournament for the first time in 15 years, irrespective of how they fare in next year’s qualifying campaign. Given the number of glorious failures that have elapsed, Scotland’s completion of their objective will be rightly cherished by the Tartan Army. The Scots also look to have unearthed a new talisman, with Forrest’s treble making it five goals in two games having previously failed to net for his country. Scotland’s task could not have been clearer – victory over Israel would secure top spot in Group C1, leaving them two games away from ending their 20-year absence from a major tournament, with any other outcome not enough for McLeish’s men. The chastening 2-1 loss to Andi Herzog’s side in Haifa the previous month was cause to be wary, however Saturday’s 4-0 triumph in Albania was a timely message of resurgence ahead of this all or nothing encounter. It was no surprise that McLeish stuck with the same starting 11 that performed with such panache in Shkoder, with the successful switch to a 4-3-3 system going a long way towards wiping the pain of the defeat by a side ranked 51 spots below the 41st placed Scots in the Fifa world rankings. That optimism was left in tatters just nine minutes into the game. It followed an uncertain start from the Scots in which their passing had lacked rhythm, while the visitors had shown particular promise down the left flank, where Eran Zahavi played the ball inside to Kayal. The former Celtic player was given too much encouragement to shoot by a static Scotland midfield, allowing him to curl the ball into Allan McGregor’s top-left corner from 25 yards. Scotland needed a spark of encouragement, and their first meaningful chance on 22 minutes brought the Tartan Army to life, with Callum McGregor’s long-range shot forcing Ariel Harush to claw wide following a marauding run by Stuart Armstrong. The Scots began to get on top of the game, with some exciting contributions from wingers Forrest and Ryan Fraser, and Scotland’s breakthrough had undoubtedly been coming by the time it arrived on 34 minutes. Armstrong’s powerful strike was unintentionally blocked by Fraser, but inadvertently served to set up Forrest who took one touch before sending a rasping drive into Harush’s bottom corner from 16 yards. It took the home side just nine minutes to turn the match on its head and it was an equally impressive finish from Forrest. Ryan Christie showed impressive determination to get to beat Yeini to Steven Fletcher’s flick on, before an exquisite flick to tee up his Celtic team-mate Forrest to calmly tuck past Harush. From a precarious position, Scotland were suddenly in control of their own destiny. As impressive as their turnaround had been, Scotland still had to finish the job off, but knew a third goal would go a long way towards sealing their progression. It arrived on 65 minutes, with Forrest capping off another excellent team move to secure his hat-trick. It began with McKenna’s interception of a loose ball down the left, with Robertson helping on his pass to release Fraser down the left channel. He beautifully threaded in Forrest who steadied himself before knocking past Harush to claim the first Scotland treble since Robert Snodgrass against Malta in September 2016. Just when the task began to look straightforward, Zahavi ensured a nervy finish with a cushioned strike from the edge of the box with 15 minutes left. Scotland had to rely on McGregor making an outstanding late save to deny substitute Tomer Hemed from close range, with the home side holding firm in the face of late pressure.